The cornerstone was laid in a grand ceremony on September 8, 1921. In the cornerstone was placed a copy of each of Stockton's papers - the Review and the Record - plus several old coins, a copy of the by-laws of Newahcuba Lodge #189, a list of the Grand Officers who had charge over the ceremonies, a list of members of local lodges, a statement of the cost description, the date of letting of the contract, and the pen used to sign the contract. The courthouse cost over $300,000 to build. The builder was Cuthbert & Sons, and the architect was F.C. Squires from Topeka. The beautiful marble located throughout the courthouse was imported by Lautz Marble Company, and the decorating was done by William Andrews Company of Chicago. The courtroom features beautiful white polished marble. The corridor floors are original ceramic tile. The doors and casings are all solid original oak. There are several original vaults throughout the courthouse with ornate door casings. In 1974, an elevator and fire escape were added to the south side of the building using identical materials to the original. In 1994, a veteran's memorial was dedicated outside of the northeast corner of the courthouse. 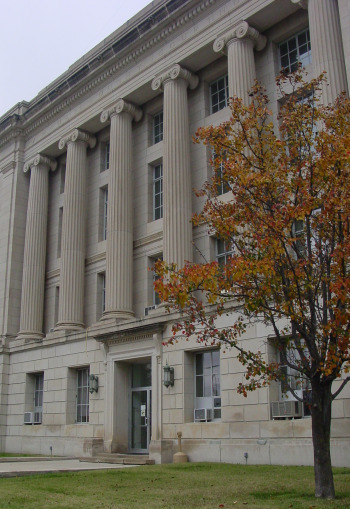 The Rooks County Courthouse is generally open Monday-Friday 8 a.m.-5 p.m.